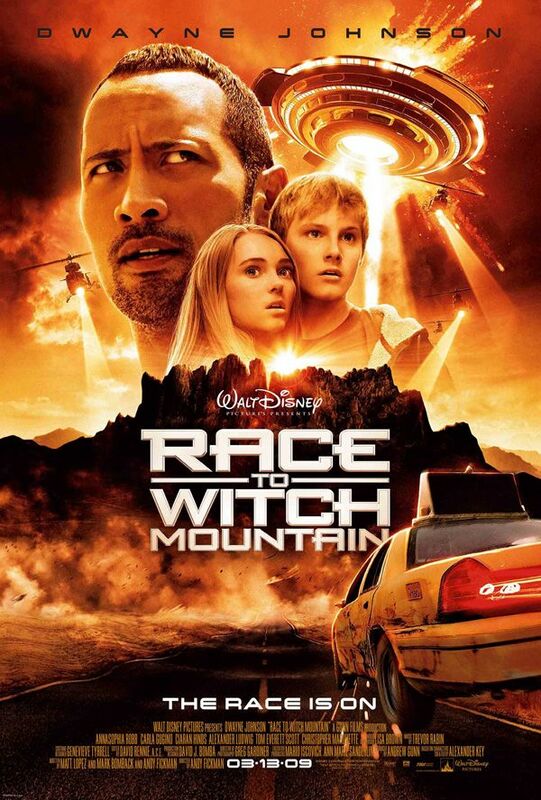 In Race we are introduced to two young siblings who crash land on Earth and are on a mission to find a piece of alien technology that is crucial to the survival of their planet. Since they are without their ship, they head to Vegas in search of an alternate means of transportation. Upon their arrival, we are introduced to Jack Bruno (Dwayne Johnson), who is definitely the strongest character throughout the film. Jack is a Vegas cabbie with a checkered past who is just trying to survive each day and make a clean name for himself. 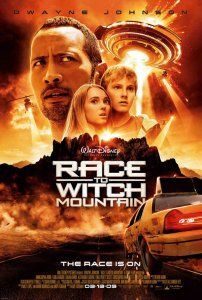 What starts out as a harmless trek across the Nevada desert turns into a high-speed, action-packed race for freedom as the kids are being hunted by U.S. government officials. When they finally reach their desired location, Jack follows them and is abruptly met by an evil alien assassin who is determined to stop the kids from achieving their dream of saving their people. This is where the action tends to heat up, and the trio is constantly hunted by the assassin and the government, making all of their lives a living hell. Though it sounds good in theory, the sequences really aren’t executed that well. Instead of allowing the scenes to breathe and letting us enjoy some of the unique set-pieces, the director chose to quick cut every two seconds and add a ridiculous score. Trust me, it gets quite annoying after a while. Even simple conversations between Bruno and Dr. Friedman (played by the always beautiful Carla Gugino) lose their affect because we literally can’t pay attention to what they are saying. That being said, the kids did have some pretty unique powers. 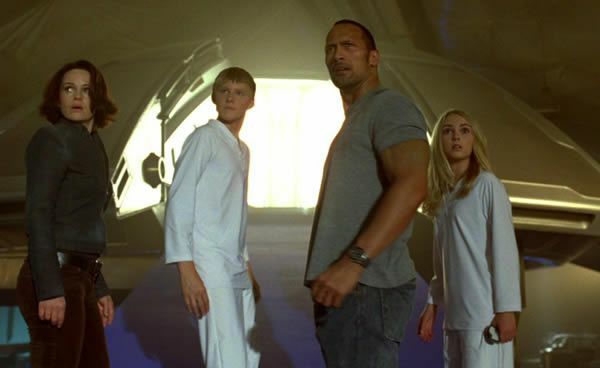 Seth (Alexander Ludwig) was able to exhibit feats of brute strength, while Sara (AnnaSophia Robb) was able to control objects using just her mind. Though their powers were pretty cool and God-like, they were very underused. I don’t understand how the trio was faced with a dilemma in nearly every scene, yet their powers were exhibited so minimally. Of course, I may be nit-picking, but that’s part of the excitement of a film like this- we as the audience want to see these siblings use their tremendous abilities to escape captivity and achieve their goal…its really a shame to see such a simple concept fall so short. I was interested in watching this film because of the idea of constant action and downright mayhem (in a PG setting of course). That being said, director Andy Fickman tried to make each and every scene so cinematic that none of them actually achieved that vision. The quick cutting and annoying music definitely didn’t help, but some of the scenes just didn’t make any sense. I know that this is a family geared popcorn movie, but that doesn’t mean that it should be idiotic. I really understand what he was trying to do, it just never quite reached its potential. Thought I have definitely seen worse movies in my time, I can’t really say I am very pleased with this one. The only similarity to the original is that kids have powers- seeing as though this may have been a complete reboot, it doesn’t bother me too much. However, die hards of the original will be hard pressed to find many parallels. As I said earlier, Dwayne Johnson was probably the strongest character in the film, but even he was underused. I can’t really blame him, as sometimes it seemed as though he got stuck between playing drama, comedy, or action- a problem that could have easily been corrected with a certain amount of direction. I don’t think that anyone should necessarily avoid this film, but there are many better options out there. If you take it for what it is, you might be slightly entertained as some of the chase sequences are riveting. However, if you are looking for a well constructed story or depth, good luck. Though there are a lot of discs in the package, there aren’t really any strong special features. We get our typical blooper reel. This wasn’t too long and was pretty useless except for a couple funny improve lines. Which Mountain? This was basically a comparison between this version and the original and contained notes by Fickman. The piece is actually kind of funny and offers some neat little trivia facts about this film that most probably wouldn’t have noticed. Though the similarities are small, he does point out the connections he tried to make- though the most significant were cast cameos. Finally, the disc had about six trailers (none for Race) from Disney films and detailed the Disney Rewards Program. As you can see, there wasn’t an abundance of special features in this set, so the only real reason to go Blu-Ray is for the audio and video. I must say that both were spectacular, but at this point, all high-def releases are packaged that way. If you MUST buy this movie, there aren’t any extra features that really make this version stand out.